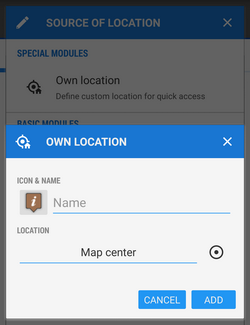 Location Selector is a very important part of Locus Map. 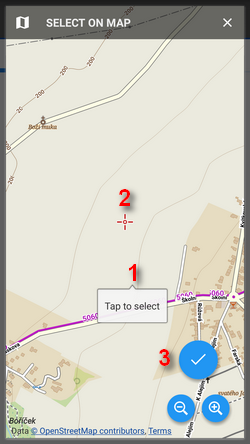 Over 20 activities link to it to define locations of points, map centers, search spots and so on. It is always triggered in a particular situation by button. The button usually follows a field with coordinates of a particular point (POI, trackpoint, etc.). The field can be empty or pre-filled depending on the situation. 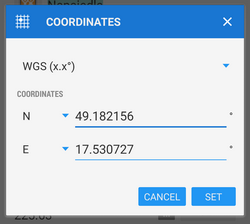 This dialog is useful when you know exact coordinates or if you need to convert coordinates from one system to another. When converting select source coordinate system, enter coordinates and select output system, Locus Map re-calculates coordinates. For more advanced users, who want to use Locus also for some specific tasks, like surveyors and others, Locus allows to use custom coordinate systems for coordinate transformations. 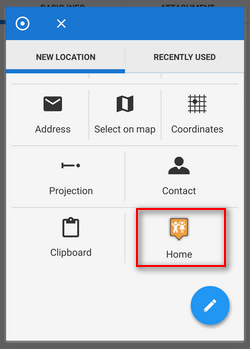 GPS - uses current GPS location. Requires correct GPS fix. 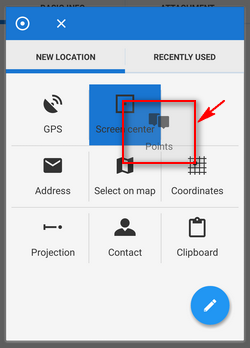 Select on map - switches a new map screen where there is possible either to tap the position directly on map (1: tap > Tap to select) or, more precisely, aim the screen center cursor (2) at the position and confirm by the hookbutton (3). Address - starts the Address search. 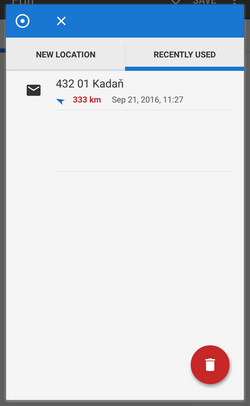 Contact - selects a contact from your device with address and locates on it. 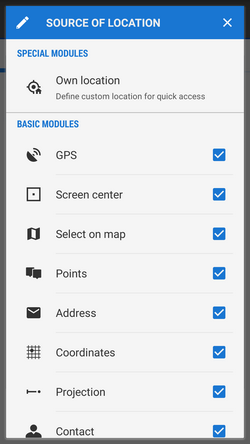 Add-on Contacts must be installed. 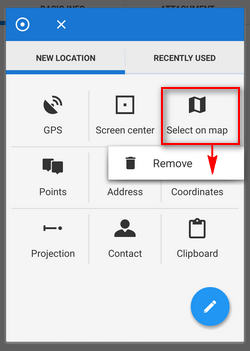 The grid can be modified - icons can be long-tapped and dragged to change position or removed, a new customized location point can be added, see Location Selector Setup below. Tab contains last used or selected locations. The points are listed according to time of use, the newest is at the top. The red “garbage can” button erases the list. 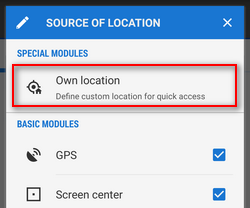 Location Selector can be customized according to your needs. 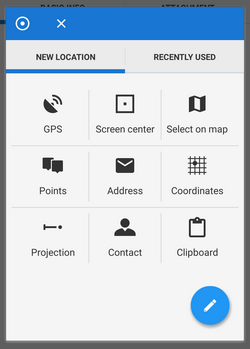 to add and remove items from the grid, tap the setup button . tap OK, a new button appears in the grid. To remove it, long-tap it and select Remove.